Toronto Dogs Directory: Missing Midland Cat Back At Home After 114 Days - A Must Read! Missing Midland Cat Back At Home After 114 Days - A Must Read! MIDLAND – It took 114 days for a Midland couple to find Lunch in South River, located midway between Huntsville and North Bay. On June 24, Lunch – a cat belonging to Diane and Gary Amon – went missing in Mikisew Provincial Park. 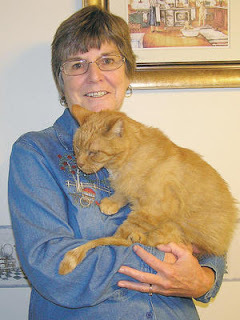 Diane, however, refused to give up hope, and she is now thankful for the combined efforts of many people in the South River area for bringing the plucky feline home. She said the cat got off his harness and disappeared into the bush while they were camping in the park. They searched for two weeks. “Everybody in the park was looking for him,” she said. They returned to Midland without Lunch. The Amons went back twice more in hopes of locating their beloved 11-year-old cat, distributing leaflets in hopes someone would recognize him. On Oct. 15, they received a call from a woman who said she had spotted Lunch entering her barn. Diane phoned relatives Dean and Lynda Carleton of South River, who headed over to the farm of Don and Marg Scarlett. It was on Oct. 16, Diane Amon’s 60th birthday, that she received the call she had been waiting for. Her cat had been found. When he left, Lunch weighed 20.2 pounds. During his adventure, he dropped to 8.2 pounds and lost his distinctive lion cut. Lunch, meanwhile, seems to have no desire for another adventure.